* Over a year ago I first heard that some shatter cones are magnetized. And I thought that sounds like something electricity could do, as from lightning. Can anything other than electricity make anything magnetic? The trouble is that rocks under stress can apparently produce electric currents. But can those little rock currents magnetize rock the way a big current from lightning can? * One website has this paragraph on shatter cones. "Shatter cones that may form beneath a meteorite impact crater are similar to what happens on a SMALL scale when a BB strikes a window and pops a cone out of the glass pane. The sharp end faces toward the impact, and the larger circular base faces away from it. Shatter cones occur on a LARGE scale when a sufficiently massy object strikes Earth. Billions of tons of rock are vaporized. Below that, rock is shattered and melted. As shock waves speed through hard rocks below and surrounding these rocks, they leave shatter cones in their wake, fossilized shock waves, their points facing toward the direction of impact. " * One problem with the bolide impact theory seems to be that fractured rock is often not found under craters. Isn't that correct? Isn't that true of Meteor Crater? - is indicative of impact (or nuclear explosion) [or lightning etc?]. * Hmm. If the K-T Boundary contains a lot of shocked quartz, would that mean worldwide impacts? Or worldwide electrical activity, like lightning? * Shatter cones are considered to be produced by shock waves, as is also shocked quartz, and lightning is known to produce shock waves, but no one seems to think about lightning producing shatter cones. So I just did a net search for anything that might connect shocked quartz to lightning and I found the following interesting material at http://www.lpl.arizona.edu/~mpasek/Pasek_CV.pdf. Check out his publications. Shocked quartz and lightning- rethinking impact hypotheses. Quartz by Lightning. Nature Geoscience, in prep. Raman mapping of a fulgurite. Analytical and Bioanalytical Chemistry 397, 2647-2658. Bryant, D.E., Greenfield, D., Walshaw, R.D., Evans, S.M., Nimmo, A.E., Smith, C., Wang, L.
Pasek, M.A., and Kee, T.P., 2009, Electrochemical studies of iron meteorites. National Academy of Sciences USA 105, 853-858.
surface of the early Earth. Astrobiology 5, 515-535.
as Sources of Reactive P the Origin and Evolution of Early Life. $305,295 for 3 years. Renewed 09/01/2010 with $255,167 for 3 years. Fulgurite. Meteoritical Society Meeting 2010. Block, K.M., Pasek, M.A., Biogenic element reduction in fulgurites. that formed Titan. Lunar and Planetary Science Conference XXXIX, Houston TX. Workshop on Astrobiology, Turku Finland. system. Geological Society of America National Meeting, Salt Lake City UT. material. 68th Meteoritical Society Meeting, Gatlinburg TN. I can't explain crater formation, but I do have an observation about craters which contradicts the theory of their formation by impact. Yet a falling body will (I think) always strike the moon or planet at an oblique angle as gravity pulls it in and therefore will always leave an elongated impact crater. Even if only slightly. Small elongated craters can be seen from photographs of where small meteors have hit the earth close to a handy photographer. But I have not counted even ONE elongated crater in all the pictures that I have seen of craters on our moon, other moons and other planets. Doesn't(/can't) this disprove/falsify the theory of crater formation by impact ? * I've heard it said that low angle impacts do form round craters, but I don't have a reference offhand. * The Giordano Bruno crater on the moon appears to have formed in 1178 AD, witnessed by Canterbury monks. There was a very bright flash, followed by a darkening of the limb of the moon for a while, then a return to normal brightness. * There is said to have been a crater that formed from a witnessed meteorite impact in Siberia in 1947. * If anyone can find references for any of this, feel free to post. And thanks. * Large craters on small moons and asteroids seem to be a good case for ED. A number of other features do too. You might consider the The Carancas impact crater. I don't think it was circular. MULTIPLE EXPLOSIONS DURING CRATERING AT CARANCAS METEORITE HIT IN PERU. We might request of, say, NASA that they formulate a crater impact computer model, and demand that the model outcome be exactly what we observe on Mars (I want to start with the Warrior Planet). When they formulate the computer model we should allow them to assume the "answer," which is where they start the exercise so that it comes out exact; that answer is what is already observable at hundreds of Martian crater locations. Then we ask for the unedited code...the algorithm as well. In other words, to get the computer video game to come out exact, and repeatedly exact, it may necessarily be wraught with exaggerations and incorrect logic, all the way to the point of being outrightly fraudulent. There are so many track-record examples to pick from. I propose this partly on the basis of their (Who? Take your pick!) prior track record w.r.t. video games and established subjects, such as (Again, take your pick)... For example, you could pick from climate models at Kyoto? How about the farcical computer simulations they produced to explain the free-fall collapse of WTC-2? WTC-1? (In these two cases NIST and Purdue come to mind). And the utterly farcical computer simulations from NIST relative to the 5pm collapse of WTC-7?! Right now their answer is 'meteor impact = crater formation,' or something very similar. So, there are two parts to the "answer" from which they start the process: The actual observable craters and meteor impact/collision. I want to see the code and the algorithm that gets them to their preconceived "answer." Mars photos with channel between "lakes"
NASA's website shows a picture of Endurance Crater and then states: "the floor and walls of the unusual crater..."
Does anyone know why this is being termed an unusual crater? In lumine tuo videbimus lumen. I think that many of the things NASA finds are unusual to them because they are attempting to shoehorn new information/data into a falsified theory. If you had provided a link, or better yet, the image, we could maybe see what has confused NASA so. 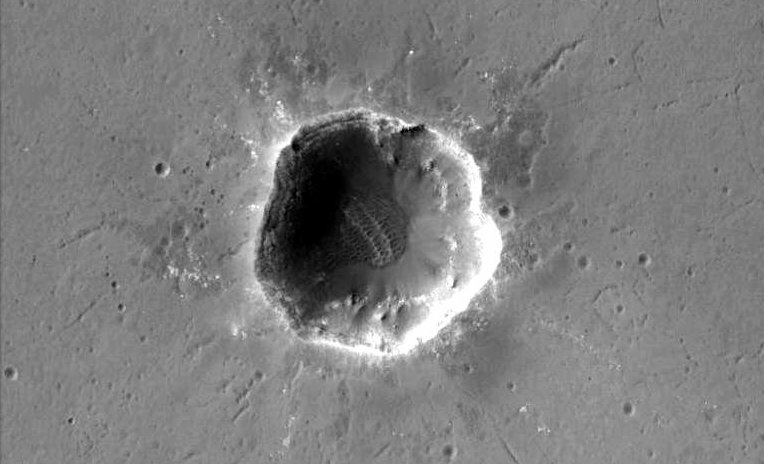 However, the image doesn't show much, since the main topic is not the crater itself but the Mars lander in it. I was just curious about why NASA thought the crater to be unusual. Looks like a crater in the APOD image. Crater images below. Always be careful opening unknown images. BABOafrica wrote: I was just curious about why NASA thought the crater to be unusual. This is one image of it, and this is another. I think it's odd that they really don't look like exactly the same crater. I don't think they are!..maybe that is what is confusing NASA! the first thing i noticed about both images was the bright crater edges. these may be underlaying minerals or continued electrical activity. I look at thumbnails, then go to NASA or other sites. Sometimes i open a link while holding my breath. I'm told that breath holding is very helpful. The image below has a NASA address, but could still be a problem. Holding my breath now. This one is probably cool. Now, retreive the url you wish to mask and copy it after the = sign in the first set of brackets. Next; type the word/s you wish to use mask the url between the two bracketed code modules, such as "Here" or "This site." Aren't these HTML codes fun?